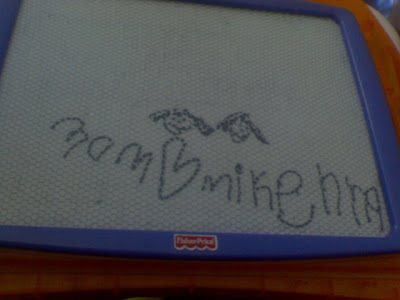 The Brown Family: Mikenna + Doodle Pro = CUTE!! I was looking through some of our pictures, and I wanted to note that last week Mikenna came up with a surprise for her mom and dad... They are awesome if I do say so myself!! Notice that Mikenna and I have girl hair while she gave daddy the boy hair!! She has always been quite the artist! 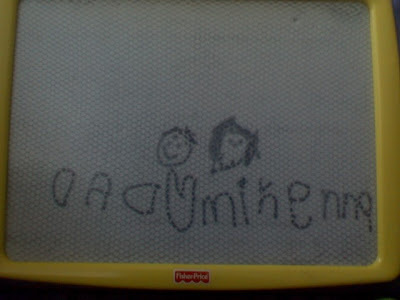 She drew the little mermaid when she was only a little over 3 years old! Complete with the fish tail and flowing hair! WE LOVE YOU MIKENNA!!! Cute!! I love the girl hair and the boy hair!! What a sweetie! !